One of the most common and most popular mammals in Pennsylvania is the white-tailed deer (Odocoileus virginianus). Whitetails inhabit the entire state and can thrive in a variety of habitats. Deer hunting in Pennsylvania is extremely popular, with an estimated 760,000 hunters pursuing whitetails annually. Natural gas development will likely have little impact on white-tailed deer because they can so quickly adapt to changing habitats. 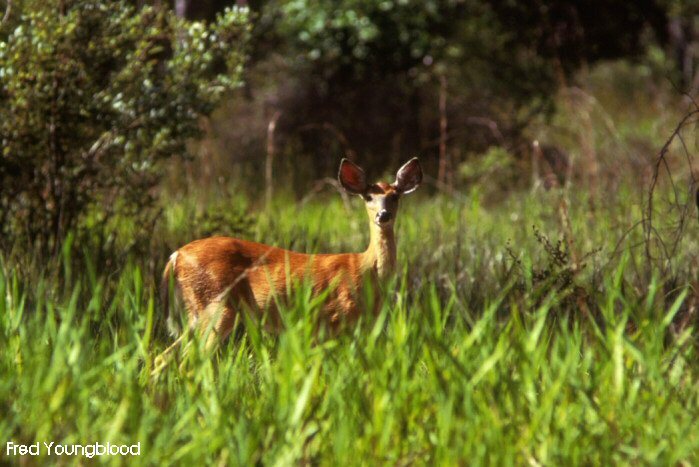 Landowners can use natural gas disturbances to create new food sources for deer. This article covers the potential impacts of natural gas development on white-tailed deer, as well as recommendations for reclamation of natural gas-related disturbances to benefit deer. Though this article focuses on white-tailed deer management, many of the recommendations will also benefit multiple game and nongame species. Natural gas development in rural areas will lead to the improvement and creation of roads to access remote drilling locations. If left ungated, these roads could help hunters reach areas that were previously inaccessible and difficult to hunt. This can be both good and bad for deer management. Researchers in northcentral Pennsylvania found that, on public land, deer harvest rates and hunting pressure declined farther away from roads and on steeper slopes. These hard-to-reach places served as “refugia” for whitetails escaping hunting pressure. As more roads are created in the Pennsylvania big woods, these refuges will begin to shrink or disappear. A benefit of the loss of refugia is that it can help land managers attain antlerless deer harvest goals. Meeting a harvest goal can be tough in remote areas where hunter access is limited. On the other hand, areas that are difficult for hunters to access allow deer to survive through the hunting season, resulting in older bucks and a deer herd with a more balanced age structure. Hunters who enjoy remote hunting experiences may have difficulty finding hard-to-reach secluded places in areas where heavy gas development is occurring. White-tailed deer are habitat generalists and can adapt to and thrive in almost any type of habitat. Therefore, it is not as critical to identify and protect specific habitat types as it would be when managing for a habitat specialist. The habitat types that should be protected are the ones that are uncommon in the area of gas development. Landowners and managers should research what habitats are lacking in their area (within about a mile) and make sure that those features are protected. In general, habitats to protect include early successional forests, low conifer cover, and mature forests dominated by mast-producing species. Early successional forests and thickets provide escape cover and browse year-round, and soft mast during the summer and early fall. In Pennsylvania, there is currently more mature forest cover than young forest cover. Therefore, it is important to limit natural gas development in early successional habitats when managing for white-tailed deer. Examples of these habitats are briar thickets, old fields, and regenerating clear-cuts. 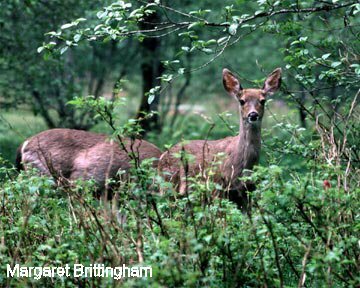 Deer often use these types of habitats as bedding areas and as escape cover. Low conifer cover can be great habitat during the winter. Hemlocks and white pines with branches growing near ground level help shield wildlife from the cold winter winds. Though whitetails in Pennsylvania do not depend on coniferous forests as much as whitetails in New England, they will usually move to and bed in coniferous forests during the winter. Mature, mast-producing forests dominated by oaks, cherries, and beech can provide important fall food sources for deer. These forests should also be protected from development. It is especially important to protect mast-producing species in the northern hardwood forests where oaks are not common. Ideal locations for development would be closed canopy forests dominated by maple or other species that provide little food or cover for whitetails. Whenever restoration of natural gas disturbance takes place, there is an opportunity to use it to create food and cover for wildlife. Improving white-tailed deer habitat through reclamation is both easy and effective. A lot of soil must be moved to create a well pad or install a pipeline. Ensuring that the soil is put back correctly is a critical step in a successful reclamation project. Topsoil should always be removed and stored separately from the subsoil. Around well pads, the topsoil is placed in a large mound adjacent to the pad. The topsoil should be planted with vegetation to prevent erosion of the soil. After a site is reclaimed, the site is recontoured and the topsoil is spread across the site. Pipelines should be installed using a method called double-ditching. Under this method the topsoil is first removed and stored, and then the subsoil is removed and stored separately. After the pipes are laid in the trench, the site can easily be restored by placing the subsoil back first, and then the topsoil, and finishing the job by seeding. Landowners who sign right-of-way agreements can require double-ditching as part of the agreement. The reclaimed site should also be limed and fertilized to help improve soil fertility and plant growth. A soil test is necessary prior to construction to see how much fertilizer and lime will be required for the site. A soil test should be required in any right-of-way agreement prior to any construction activities. For pads, which generally are not immediately reclaimed, it is best to require two soil tests: the first prior to clearing for the pad (to gauge natural conditions) and the second before reclamation (to assess current conditions). All reclamation projects require establishing herbaceous vegetation for erosion control. The herbaceous species that are planted play a large role in how effective the reclaimed site is for white-tailed deer. Understanding deer nutrition and plant growth patterns will help landowners make wise decisions in which vegetation to use for reclamation. A whitetail’s nutritional needs change throughout the year, and landowners can plant several types of vegetation to address the changing needs. In the spring and summer whitetails need protein, which is important for muscle and bone growth and milk production. Thus, protein demands are highest during the spring and summer months. Most popular food plot mixes contain plants high in protein. During the fall and winter, deer seek out foods high in carbohydrates for energy. The best planting option for carbohydrates is corn. Cereal grains such as oats or wheat can be sources of both protein and carbohydrates. Another factor to consider is plant growth pattern. Plants that germinate, go to seed, and die all within one growing season are considered annuals. Perennial vegetation has a well-established root system that allows the plants to survive for several years. Most annuals are easier to establish and produce more forage in a year than perennials because of faster growth rates. However, annual plantings need to be reseeded every year. The majority of reclamation plantings should contain both an annual cover crop and perennial vegetation. The cover crop will germinate and grow quickly, which is important for erosion control. Cereal grains (wheat, oats, and annual rye) are the recommended plantings for cover crops. Any of these species can be planted at one bushel/acre along with the selected perennials. These species not only are good site stabilizers but also are palatable for deer. Of these three species, oats (Avena sativa) are likely most preferred by deer. However, oats are sensitive to soil acidity and fertility and to cold temperatures. Wheat (Triticum aestivum) may not be as preferred as oats, but it is more winter hardy. Wheat also produces seed that wild turkeys relish. Rye (Secale cereale) is the least preferred of the three species, but is the most cold- and acid-tolerant species. Annual rye should be used as a cover crop if planted late in the fall or on sites with poor soil fertility. Do not confuse annual rye with annual or perennial ryegrass (Lolium spp.). Ryegrass has very little wildlife value and will take over a reclaimed site, resulting in a wildlife wasteland monoculture. There are many species to pick from to fulfill the perennial component of the seeding mixture. The most popular perennials used in both reclamation and food plots are clovers. These legumes are cold-tolerant, preferred by deer, and high in protein. Clovers suitable for reclamation plantings in Pennsylvania include alsike clover (Trifolium hybridum), white dutch clover (Trifolium repens), and ladino clover (Trifolium repens). Other options include birdsfoot trefoil (Lotus corniculatus) and forage chicory (Chicorium intybus). Small burnet (Sanguisorba minor) and sweetclover (Melilotus spp.) are two species that are less preferred but are excellent for use on highly degraded sites. Many other species not listed here can be planted for deer. The planting options are almost endless, and can be adjusted to address nutritional gaps or to create ideal hunting spots. For more information on species to plant and establishment techniques, refer to the book Quality Food Plots, published by the Quality Deer Management Association. One group of plants to avoid is cool-season perennial grasses. These are commonly used in reclamation plantings because they establish quickly, grow very densely, and are great for erosion control. However, these plants offer very little for wildlife and will generally outcompete any beneficial vegetation. Species to avoid include tall fescue (Festuca arundinacea), ryegrass (Lolium spp. ), and orchardgrass (Dactylis glomerata). These species should be used only on steep sites that are prone to erosion. When whitetails feel threatened by predators or hunters, they often head for cover. Whitetails are very adaptable and can be found in all kinds of cover, from regenerating timber harvests to thickets to old fields. It is important to consider cover when creating the reclamation plan. If there is ample food but no cover available, then deer use of the food source will be limited, especially during the day. Food sources are much more attractive when they are located within close proximity to cover. The perimeter of food sources can easily be modified to provide cover around the food source. In forested settings, an easy way to create cover along the edges of well pads and pipelines is a border edge cut, in which trees are cut adjacent to an opening such as a restored pipeline, impoundment, or well pad. The increased sunlight will cause a flush of new growth of briars, seedlings, and shrubs along the edge of the opening. These edges can become very thick within a few years. Whitetails generally feel more comfortable feeding in openings when this kind of cover is nearby. According to the Natural Resource Conservation Service, a border edge cut should be 50–120 feet wide and consist of two adjacent zones. The first zone is in the half of the strip closest to the opening. In this zone, 75% of the canopy should be removed. The best way to create cover is to cut the trees and let them lay, but removing the cut trees is also an option. In the half farthest from the opening, cut 50% of the canopy. In both zones, trees and shrubs beneficial for wildlife can be retained. Landowners unfamiliar with tree identification or safe cutting practices should hire a forester and experienced cutter to mark which trees to save and to safely cut the ones to remove. Trees and shrubs can also be planted to create cover. Shrubs such as hawthorne (Crataegus spp. ), crabapples (Malus spp. ), and American hazelnut (Corylus americana) will provide cover and produce mast as well. A great option for both food and cover is blackberries (Rubus spp.). Blackberries provide excellent escape and fawning cover, produce mast, and are a preferred browse species. Blackberry thickets are often heavily used by both game and nongame species. Shrubs can be planted on restored well pads and impoundments. Shrubs can also likely be planted along the edge of pipelines and in the temporary work area, but cannot be planted where they will hinder pipeline access and maintenance. White-tailed deer are very adaptable to disturbance and changing landscapes. Marcellus shale development is unlikely to have any large-scale impact on whitetail populations. It is common to see whitetails feeding on restored pipelines and even near well pads. Multiple reclamation options will benefit whitetails because they are so adaptable. The best reclamation option addresses the limiting resource on the property or landscape. In addition, consider which management options will benefit not only the deer on a property, but other wildlife species as well. For more information on Marcellus shale development and other wildlife, see Featured Wildlife Species on this website. Adams, M.B., P.J. Edwards, W.M. Ford, J.B. Johnson, T.M. Schuler, M. Thomas-Van Gundy, and F. Wood. 2011. Effects of Development of a Natural Gas Well and Associated Pipeline on the Natural and Scientific Resources of the Fernow Experimental Forest. United States Department of Agriculture, Forest Service, Northern Research Station General Technical Report NRS-76. Campbell, T.A., B.R. Laseter, W.M. Ford, and K.V. Miller. 2004. Unusual white-tailed deer movements to a gas well in the central Appalachians. Wildlife Society Bulletin 32: 983-986. Kammermeyer, K., K.V. Miller, and L. Thomas, Jr., eds. 2006. Quality Food Plots: Your Guide to Better Deer and Better Deer Hunting. Quality Deer Management Association, Bogart, GA.
Pennsylvania Department of Conservation of Natural Resources. 2011. Guidelines for Administering Oil and Gas Activity on State Forest Lands. Version 2011-1. San Julian, G.J., and S.S. Smith. 2009. From the Woods: White-Tailed Deer. Penn State College of Agricultural Sciences Agricultural Research and Cooperative Extension Publication UH148.